The BlackBerry Curve 9320 is a relatively low cost messaging device which is closely related to the BlackBerry Curve 9220 which was launched last month. It's a slight upgrade to the old Curve 9300 and it sits a little below the Curve 9360 in RIM's product range. 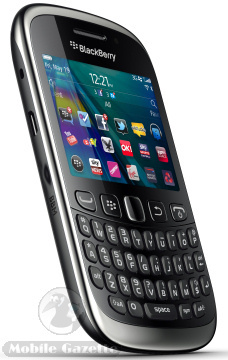 This is a straight and pretty minor update to the old Curve 9300, the main difference being that the 9320 runs the latest edition of the BlackBerry OS, version 7.1 and it comes with a better camera and some other minor tweaks such as a dedicated key for BBM. 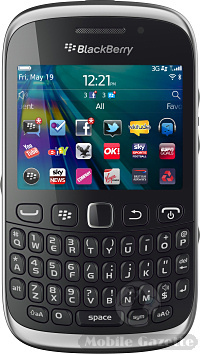 The 9320 is a very conventional looking BlackBerry, with a compact QWERTY keyboard, a 2.44" 320 x 240 pixel display, a 3.2 megapixel camera and WiFi and 3.5G connectivity plus GPS and mobile hotspot support. It does everything that every other BlackBerry does, and for an entry-level smartphone the specification isn't bad at all. Inside is a 1450 mAh battery, the BlackBerry Curve 9320 measures 109 x 60 x 12.7mm and weighs 103 grams. It looks identical to the 9220, but there's very little chance of market confusion as the 9220 is for the Indian market only. RIM say that the 9320 will be available on various carriers worldwide. In the UK, the 3 network have announced that the handset will be available from 14th May for £140 for the prepay version or free on a £15/month contract, T-Mobile UK are offering a similar deal of £150 prepay or free on a £15.50/month contract. No doubt many other operators will be joining them.